August 13, 2016 (The New Atlas) - Predictably, the tenuous corridor militant forces have created in southwest Aleppo has become a killing field, battered by artillery, missiles, bombs and other direct and indirect weaponry. The militants who created it appear to have operationally lost momentum, with Syrian forces incrementally taking back temporarily lost territory. The use of this corridor to "relieve" militant forces trapped inside Aleppo is questionable at best. 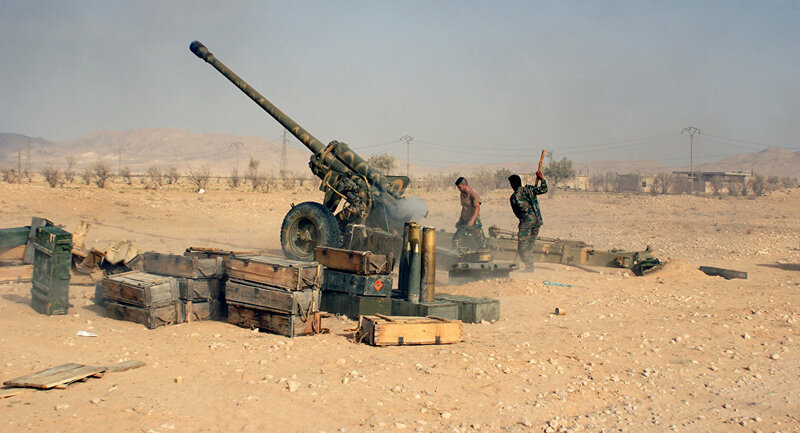 The concentration of forces required to accomplish even this much has exposed a large number of militants to liquidation on the battlefield and furthermore, has exposed much of the logistical network throughout Idlib province to Syrian and Russian airstrikes due to the increase in activity and the concentrated nature of the offensive. The entire concept of the operation, breaking the encirclement by Syrian ground forces with Syrian and Russian airpower overhead, appears flawed. It is especially so, considering the current offensive involves only one axis of advance at one particular spot on the map. The offensive has not addressed the fundamental realities of why Aleppo is encircled in the first place nor has it established a breakthrough that is in any way sustainable. And while other plans could have created a much larger and more sustainable break in the encirclement, they have not been employed either because of a lack of strategic vision or strategic competence, a lack of manpower and materiel or likely a combination of these factors. And if that is so, then the real thought behind the operation may have been political. The West and its Persian Gulf allies, the primary underwriters of the entire war and the militants currently embattled in and around Aleppo, have gone through great lengths to portray the pivotal battle as "rebels desperately trying to save 300,000 encircled civilians." As part of this rhetoric, the Western media has engaged in a concerted public relations campaign, presenting a document they claim was written by 15 individuals alleging to be doctors, pleading with the US to intervene amid the ongoing fighting around Aleppo. The media offers no evidence that these individuals are doctors, or that these individuals even exist at all. What clearly does exist however, is a desperate need for a humanitarian pretext with which the US and its allies can cite to more directly intervene and change the tides in a proxy war they are decidedly losing. 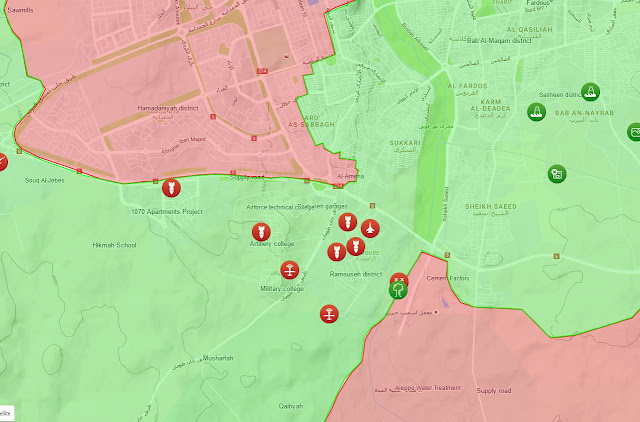 The ability to establish a ceasefire and in some way salvage those forces trapped at the centre of Aleppo, perhaps even allowing them to escape, exists on the lower end of extremes. On the higher end, there is the prospect of Western military power being used to directly intervene against Syrian forces if and when they are able to "shame" Russia into the shadows. However, this has been tried many times before, with much greater prospects of succeeding, yet to no avail. The only aspect of the war in Syria that exists in greater quantities for the West now is desperation. And while the West is becoming increasingly desperate (and dangerous as a consequence), it seems that Syrian resolve and the resolve of its allies has increased right along with it. The Western media has attempted to portray Syrian forces as "spent" since 2011. Today, they are again claiming that they lack the ability to fully secure Aleppo because they are "spent." The fact that Aleppo was encircled in the first place suggests that isn't so. The necessity for the West and its militants to depend on political ploys and symbolic victories versus the very real, albeit slow progress the Syrian military is making around Aleppo suggests that despite the see-sawing battles we are witnessing, zooming out reveals a vector sum working in Damascus' favour. And Damascus abandoning this success is very unlikely. Depending on what factors have finally allowed Syria to gain the upper-hand against foreign-backed militant forces, this progress may continue at its current pace, or even accelerate. Turkey's apparent restoration of ties with Russia will be confirmed if Turkish forces begin securing their border with Syria and cutting off the flow of fighters and weapons, particularly in Idlib. If this occurs, a general collapse in militant fighting capacity across Idlib will unfold rather quickly. Should this success be owed entirely to Russian assistance, progress will continue, though likely at a slower pace. Either way, only something drastic is likely to change the West's fortunes. But something drastic is precisely what one would expect from someone equally desperate.